This embellishment process adds quality and professionalism to any type of garment. 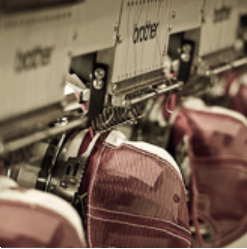 We embroider in-house to ensure the final results are exactly what you're looking for. We can create or modify any existing logo. With a minimum of 12 garments; screen printed t-shirts, polos, sweatshirts, tote bags, towels, and dozens of other types of garments is a major part of our daily operation. We work with all types of companies, such as; corporations, schools, churches, private label and many more. We specialize in high QC, fast and dependable commitment dates and competitive pricing. Our goal is to give you a smooth, fun, and easy experience. We can cut out the inside size label and replace it with an inside pad print. This offers another way to add your logo (or branding) to your products offering in a price effective way. Full Package printing is another way of saying "We can do everything from A to Z" in regards to t-shirts and other garments. This is mainly for our customers that are selling their product in a retail setting. Other finishing options like, Hang Tags, Folding, Poly-Bag & Size Sticker are also available.